They lay at our feet in a thousand jagged pieces. Misshapen and knifelike, trauma ruthlessly casts its heap of serrated shards for reassembly--piece by piece--and hovers over us until we can reconstruct them back into a meaningful whole. It's never the same, though. Like dried-up tributaries on a scorched and disappointed earth, these cracks fan out in aimless directions. They become the markings of where we have been, the craggy boundaries of our emotional limits, the events that shatter our souls--if only for a moment. It's the voice on the other end that informs you of a beloved's unexpected death. But I just had lunch with him yesterday. It's the grim, yet clinically delivered diagnosis that you replay over and over in your head. What are my chances? What do I tell my children? WHY would someone hurt me this way? WHY? Trauma does not discriminate and often leaves us in a state of disrepair. We are all secret-keepers and soul-bearers of leveling tales of heartbreak. Once the shards are collected, the agonizing reconstruction begins. Throughout my life, I shuddered every time I looked at the reflection of my own reassembly. The gaps and fractures glared back-- taunting echoes of all of my shattered places. And the moments when I think I would never be whole again. All along, my mind has been seduced by those echoes--convincing myself that "broken" equals irreversible imperfection and an ugly legacy. But that was before I saw a friend's post of exquisite Japanese pottery. There it was--a formerly shattered pot with its glimmering gold grout among what Hemingway called "the broken places". The damaged pot emerged as a stronger and more breathtakingly beautiful version of its original self, even more valuable now that its imperfections basked in their golden acceptance. 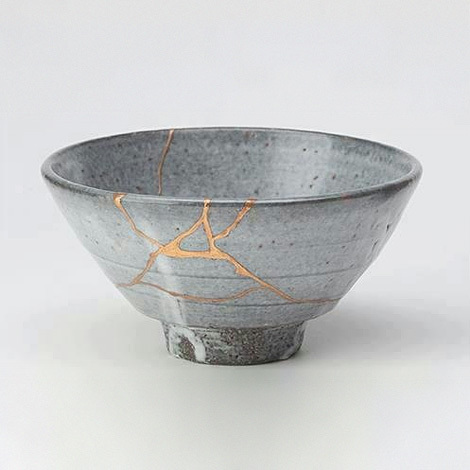 This notion of kintsugi--the Japanese art of golden repair--represents a beautiful lens through which to view our own disjointed fault lines. Why shouldn't we pave our broken places with gold? Despite their blistering fallout, the worst moments of our lives still reflect our purest beauty and strength. Pain often cajoles our tenderest vulnerability and uncovers the most delicate layers of who we really are. Unfortunately, life breaks all of us at some point--causing splintering cracks that reveal our injuries, our sadness, our damage. Once gilded, those same cracks celebrate our resilience, our strength, our amazing truths and beautiful legacies. We owe it to ourselves to gild these fractures and to recognize them as our golden places. After all, they make us more empathetic, more human, more courageous and more gorgeous. Awesome post. Now I know why gold is often the reward for great human achievements.